3. Is my portfolio too risky? Tell this site what you hold, and it estimates how much volatility you can expect your investments to deliver, as well as an expected return. As the site itself warns, such projections should be taken "with a grain of salt" -- we'd say a lump. But Portfolio Monkey's calculations are built on well-known research showing that factors like company size, valuation, and past volatility help predict a stock's performance. Use the site to supplement your usual stock analysis. For example, Microsoft and Dell may seem similar in that they are both blue-chip tech firms, but Portfolio Monkey says Dell is notably more volatile. 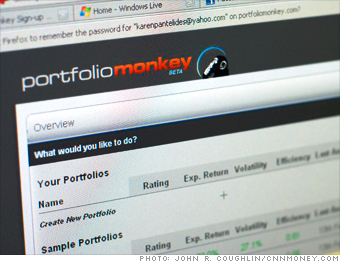 Coolest feature: The Probability Analyzer shows how much your portfolio could grow -- or shrink. Try this too: Morningstar.com for a snapshot of a stock's fundamentals. NEXT: 4. How do I find my next stock pick?